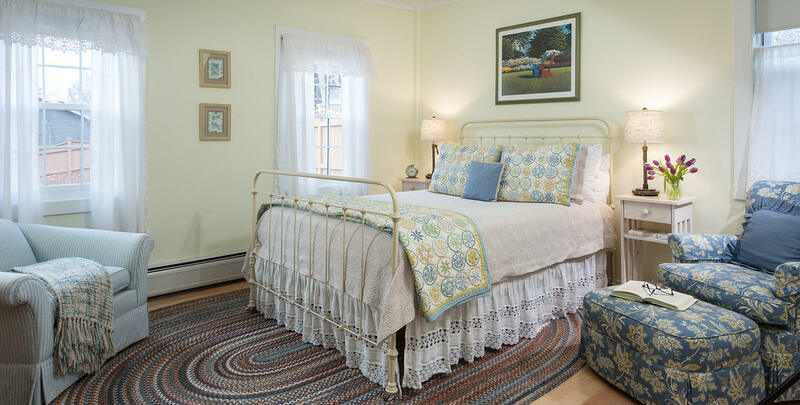 One of two guest bedrooms in the 1851 Carriage House, The Galloway room is located on the ground level. Guests who choose this guest bedroom do so because it is separate from the main house and is serenely quiet. Because the Carriage House was formerly a barn, it does not have the heavy Victorian woodwork of the main house, but has simple trim and baseboards. 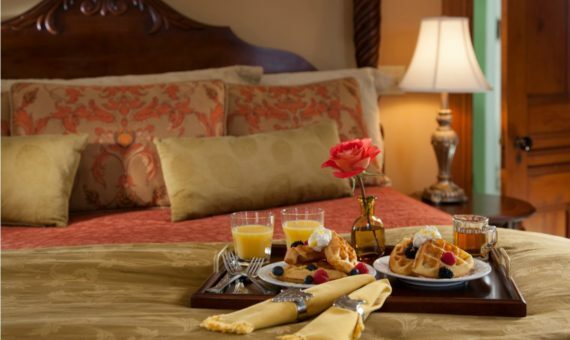 Our romantic hotel in Burlington, VT is perfect for your honeymoon in Vermont. The Galloway room has a beautiful maple wood floor that adds warmth and brightness to the room. The pastel-painted walls, an ivory iron queen bed and three windows add to the airy feel of the room. Galloway is quiet and cozy with two reading chairs, one ottoman, and a pine chest of drawers for storing personal belongings. The north-facing windows provide views of the garden. The shower-stall bathroom also has a maple wood floor and a pedestal sink. This guest bedroom is not strictly ADA compliant, but it is a good choice for guests who appreciate the ease of walking directly from the garden stone pathway into their guest bedroom (no stairs to climb).